It’s been a while in the making, but there again, you can’t rush perfection. We’re now rather happy with this rather special bit of Clachaig Propaganda. Call it a labour of love. 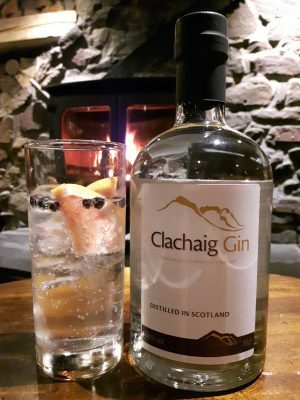 A classic gin – very smooth with a sweet start accentuated by a light peppery mouth feel, followed by a gentle sherbet finish as the citrus develops towards the end. Best enjoyed on a lazy, sunny Glencoe afternoon with dramatic views of the mighty west face of Aonach Dubh. But we’re sure it’ll taste not bad wherever you live too! 70cl bottle. 40% by volume. Distilled in Scotland. By clicking on the Paypal button you are confirming that you are at least 18 years old. Drink responsibly. For multiple quantities, update the number required in your PayPal shopping cart. We are only able to post to UK addresses. Our gin is dispatched in a special protective airsac and double skin cardboard outer for protection. Propaganda is a form of communication aimed at influencing the attitude of a community toward some cause or position. – Wikipedia. From humble beginnings and our classic navy blue climber t-shirt the range of Clachaig Propaganda has grown considerably – and continues to do so. Whether as a little treat for yourself, or the ideal gift for the Clachaig fan in your life, we hope that you find something you like. We’ve included prices for single purchases at UK 1st class rates. If you wish to make multiple purchases, or would like a quote for overseas postage, please Contact Clachaig for a multiple item quote. If you’re buying a t-shirt then you may wish to enter our competition and win another one. It’s easy! For convenience and simplicity all our items are available for online purchase using Paypal. Items are listed with the default UK postage charge. For deliveries outside the UK, where available, the additional charge is automatically added to the default UK rate. Where a choice of size is available, note that we are unable to provide sufficient options within the PayPal buttons, so please contact us directly and we’ll offer an alternative way to order. If you would prefer not to use PayPal you can use our Secure Online Payment form, but please ensure that you use the ‘other information’ box to correctly describe the products you require. Payment by direct bank transfer is also available. Contact us for details, along with your order.